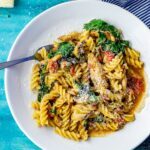 This one pot pasta with chicken, spinach & mushroom is ready in 30 minutes & makes a great weeknight meal. Add any veg you like to make it even healthier! Heat the oil over a medium heat. Cook the onion for a few minutes until softened. Add the garlic, spices and chicken and cook until the chicken is almost cooked, about 10 minutes. Add the mushrooms, cook for a few more minutes. Add the pasta, tomatoes, stock, Worcestershire sauce and milk plus a big sprinkling of salt and pepper. Bring everything to the boil and then simmer for about 10-15 minutes. I found that the pasta took a little longer to cook than normal so you might need about 15 minutes. A few minutes before the end of cooking add the spinach and let wilt into the pasta. Once the pasta is cooked serve topped with a sprinkling of parmesan if you like.